A romantic pairing of goods, being sold together b/c I can’t bear to separate them. 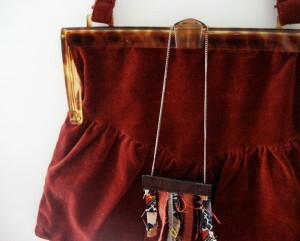 I’ve had this amazing vintage velvet handbag for about a million years. Although it has a truly 40’s vibe, I believe from the label that it is a 70’s era 40’s-revival. So, that means it’s only about 50+ years old (!). Deep rust color with a lovely tortoise shell frame and wonderful clasp. See photo with hand for size reference. The other piece is a necklace I purchased from New Orleans etsy seller Bayou Salvage, whose shop seems to be down or I’d provide a link. Her work is lovely and, I believe, was at one time carried by anthropolgie. 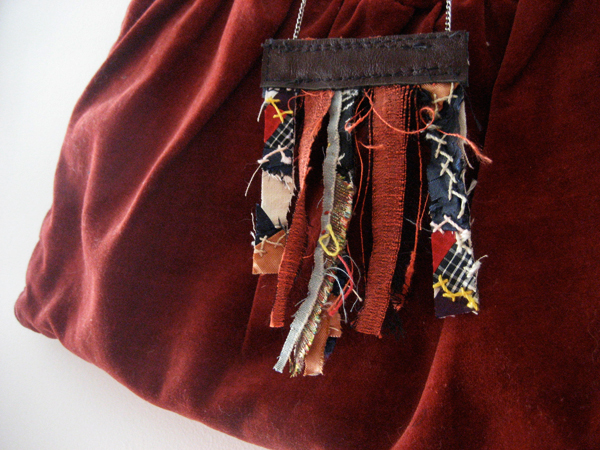 This necklace is a very dear construction of leather and scrap, including pieces of a crazy quilt. Silver chain, about 18 inches, but email me to confirm. If you’re a romantic modern urban vintage type, or maybe a glam-inspired girl, these precious goodies are just your thing. 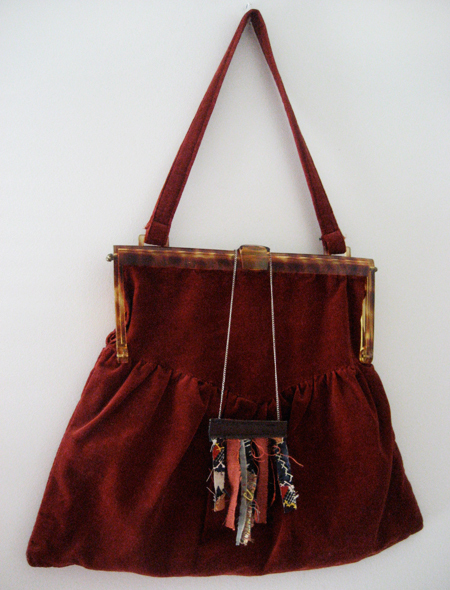 Great for all seasons with your winter woolens or summer linens. A steal at this price and would make a lovely holiday gift package for someone special, including YOU! Condition: Both pieces are in excellent perfect shape. 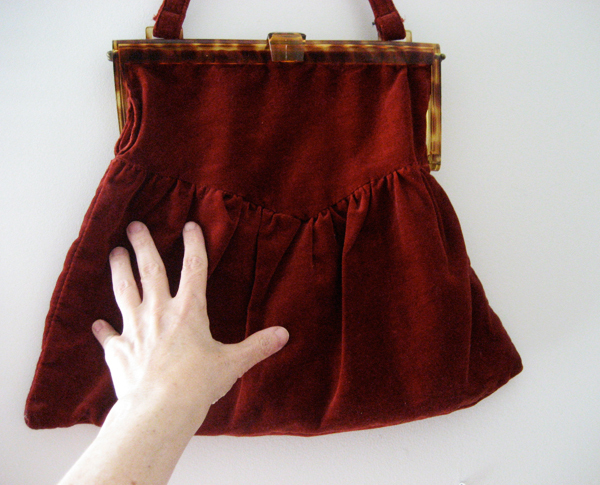 The purse IS vintage, but with no flaws and clasp works well. Necklace is tattery, but that’s the style. 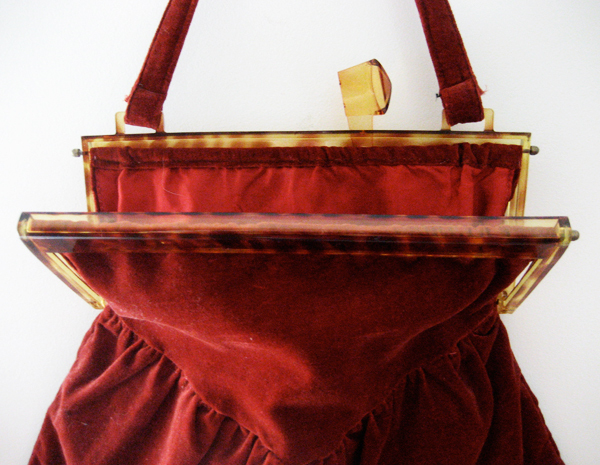 Returns: This pairing is final sale since you don’t need to try these pieces on. Email me if you have any questions, ok?